I’ve chopped, smashed, and stabbed more medieval bodies in the past few days than I can count. I’ve also been cut open, impaled, and beheaded more times than I care to admit. 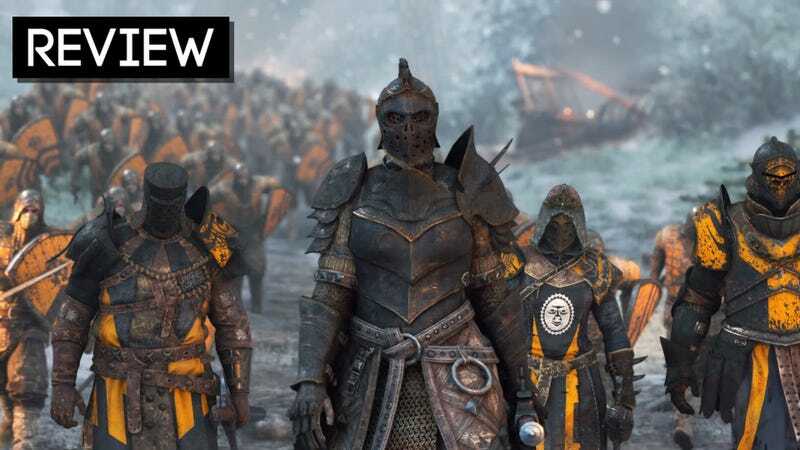 Kill and be killed—that’s the proposition at the heart of For Honor, a game in which burly men and women swing crafted hunks of metal at one another until someone eventually bites it. It’s a humble vision, but one the game manages to turn into an art form all its own. These bloodbaths predominantly happen across a handful of multiplayer modes in which you play as a range of deadly warriors from different centuries, continents, and fighting traditions neatly partitioned into three categories: Knights, Vikings, and Samurai. The majority of the game’s focus is on five different competitive modes, all of which are variations on either deathmatch or capture-the-point. In Dominion for instance, two teams of four fight to control sections of the map and accrue points until the opposition loses the ability to respawn and can be definitively dispatched. Each side has grunt NPC soldiers, similar to Dynasty Warriors, that slowly try to push the other team back. Brawl, on the other hand, is a best-of-five 2v2 duel in which the aim is to be the last team standing. The other three modes have small twists but for the most part simply change the number of players involved. It’s not the most extensive list, particularly when you consider that all five are really just variations on two common multiplayer modes, but the moment-to-moment dynamics of the game’s melee combat are so novel and well tuned that the conditions under which each fight occurs ultimately feels secondary. Despite its multiplayer focus, For Honor, perhaps encouraged by the struggles of Titanfall, Evolve, and Battlefront, does have a single-player story mode. At times it can feel like a glorified practice mode, and you still have to be connected to the Internet to play it, but the 5-10 hour campaign does benefit from some solid AI at harder difficulties, opportunities for bonus loot drops, and who would have guessed it: boss fights. But regardless of what mode you’re playing in, what sets For Honor apart its unique blend of third-person, Souls-y melee combat with the technical demand and precision of classic fighting games. The simplicity of For Honor’s core conceit is a virtue rather than a shortcoming. Players attack cautiously, guard desperately, and die quickly. While there are a few other mechanics layered on top of that, including character-specific combos and special cool-down abilities, none of them obscure the underlying clarity of For Honor’s combat. This system, christened “the Art of Battle” by Ubisoft, is predicated on three different stances. Fighters can hold their weapon to the left, right, or overhead. While in that pose, they can only block and attack from that same direction. Button prompts let you know which way your opponent is facing and when they’ve started an attacking motion. It’s basic enough, and the game’s tutorial does a brilliant, straightforward job of illustrating it. But in practice, a few additional wrinkles compounded by the fundamental unpredictability of your human enemies make combat continually feel equal parts exhilarating and stressful in the most understated way possible. In my first match I fought as a Warden, one of the game’s more generic-looking knights and a jack-of-all-trades fighter. My opponent, standing about thirty meters away from me on the other side of a rampart, was a Viking Raider. Sprinting is free in For Honor, so we started running towards one another like old high school buddies at a twenty year reunion. When I stopped he kept going, piercing me with his halberd and slinging me to the ground. He started to swing left, so I blocked left, but as the bigger guy his strike still managed to chip away at my health. Trying to leverage my smaller fighter’s agility and combination speed, I began unloading light attacks from all different angles like an amateur at a boxing gym trying to substitute ferocity for technique. The raider, a step behind each of my attacks, looked on the verge of giving out, if only my stamina bar hadn’t hit empty first. Sensing his opening, the Viking charged me one last time and sent me tumbling off the wall into the ravine below. In his 18th century book on Bushido titled Hagakure, Yamamoto Tsunetomo writes, “The Way of the Samurai is found in death.” Those not resolved to their deaths beforehand, he suggested, were certain to die “in bad form.” Death is not permanent in For Honor, and yet somehow, at least once during every match, a sense of panic will begin to take over. The times I’ve tried to make up for one mistake by rapidly committing another are too many to count, and after those fights, as my decapitated corpse tumbled to the ground, I can only imagine the befuddled amusement on my opponent’s face when she saw me momentarily completely forget how to play the game. In addition to the three combat stances, every fighter has a light and heavy attack at their disposal, as well as a handful of unique combos that allow them to chain attacks together more quickly in order to take advantage of a potential opening before an opponent has time to reset. When an opponent attacks, they can be blocked or countered by correctly timing a heavy attack in the corresponding direction. Likewise, there are guard breaks, which momentarily throw opponents off balance and can only be countered by another guard break. This list of maneuvers might seem short, but when multiplied by the twelve different character classes, all of which have specific strengths and weaknesses, the possibilities in a given fight grow exponentially. Especially when you throw in “feats,” customizable cool-down abilities reserved only for certain game modes that let players do anything from heal themselves to unleash archer support for area-of-effect damage to surrounding enemies. Additionally, there is a meta-game surrounding players’ performances in each match. You select a faction to represent (I chose Knights, but everyone else seems to be rolling Samurai) and collect “war assets” for that faction by completing matches. The better you do—more kills, more objectives taken—the more of these points you can deploy on different maps to try and expand your faction’s domain. Rewards will be doled out every few weeks based on whose faction holds the most territory. It’s a neat way to augment the stakes of a given match, but in truth the system doesn’t require much thought or input. Instead, For Honor’s real meta-game revolves around trying to overcome its stingy economy. Every character class is available to play at the start of the game, but only “unlocked” ones can have their appearances, abilities, and equipment customized. Anyone who played Rainbow Six: Siege should be familiar with this setup. That game also came with an arduous treadmill of unlocks and level-ups that encouraged players to leverage microtransactions in order to save time and not wait tens of hours before being able to experience the breadth and depth of the game’s characters and loadouts. In For Honor, everything from loot crates to new taunts can be purchased using in-game currency, called steel, which can in turn be purchased with real money or accrued slowly over the course of playing matches and completing daily “orders” (win five elimination matches, kill eight players without dying, etc.). This tedious layer to the game would be easier to overlook if showing off what a cool badass you are wasn’t a fundamental part of For Honor’s appeal. The game is more Street Fighter V than Rocket League in this regard, with lots of add-ons to shop for but not nearly enough cash to do so. In For Honor, multiplayer matches will net you, on average, somewhere between twenty and fifty steel. Completing daily orders will give you several hundred more. Finish ten matches and you might be able to earn 500 in-game currency as a result. That’s just over 1% of what’s necessary to be able to purchase three “mythic outfits.” If you decide you’d rather buy the required amount of steel outright as a microtransaction, you’d better be prepared to pony up somewhere in the neighborhood of $30. That’s half the price of the game. For three skins. Fighting games have always relied on spurious back stories to engineer epic battles. In Mortal Kombat II, Shao Kahn holds a tournament to try to conquer earth. In Marvel vs. Capcom 3, Victor von Doom opens up a portal to another universe and then unleashes his fellow villains on it. In For Honor, a hole opened up in the ground that spilled forth the most realistic LARPers you’ve ever seen. The campaign makes a nice change of pace from the multiplayer frenzy. There are three separate chapters, one for each faction, that follow different warriors as they grapple with burden of never-ending war. Where the campaign stumbles is when it goes hard on trying to offer a meditation on violence and human nature. The boss fights, however, help make it more bearable by pitting you against overpowered heavies that nevertheless still follow the underlying logic of the game’s combat. In other words there are no gimmicks—just you, your creativity, and your reflexes vs. a bigger, deadlier foe. If you push the difficulty up to “realistic,” you can even try to your luck at these fights without any reticle to indicate what stance they’re in or when an attack will hit. These fights are a nice, challenging alternative to duking it out with other against other humans, even if the story surrounding them feels overly disposable. More disappointing is that the unlocks during the single-player campaign don’t carry over to the rest of the game. It feels like a particularly heinous oversight given the rest of For Honor’s in-game economy. For a game that shines most when two fighters are trading blows and counters in the moment, caught midway between existential terror and an adolescent medieval power fantasy, it’s disappointing how much of the game can be overshadowed by an all-encompassing loot grind. Fortunately, For Honor just feels so damn good most of the time that it ultimately doesn’t matter. Even the most clumsy and gnarled duel will achieve moments of greatness. And when two experienced players operating on the same wave-length begin stringing together slashes, parries and counter-attacks in an unbroken chain, the resulting exchange feels as much like a choreographed ballet as a fight to the death…if ballets ended with severed heads flying into the orchestra.